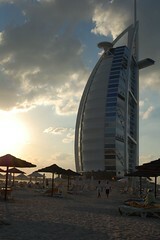 Dubai is difficult to describe in a few words. The conventional wisdom is that it is a money centric society that is entirely driven by the desire to build the biggest, tallest, most outrageous structures on the face of the earth. Whilst this is true, and overheard conversations in restaurants tend to back this up, there is more to the story than that. The desire behind the drive to build, build, build is the need to transform this formerly oil rich emirate into a tourist destination for the new millenium. To this end the approach has been to attract the extremely rich to properties such as the world’s only (self appointed) 7 Star hotel (the Burj al Arab). But there are only so many extremely rich people to go around. Once you have catered for this exclusive section of society the building spree needs to attract the ‘common man’. This man will not able to afford to stay on the beach front, will not go shopping in the Rodeo Drive section of the Mall of the Emirates and nor will they eat at a Michelin starred restaurant. In some ways this will be a good thing for Dubai; the gulf in wealth between the select few who are in charge of this building spree and those actually doing the building is immense. On one hand there are Bentleys, Porshes and Maseratis being driven to and from the supermarket whilst at the same time the workers are being ferried from their company provided accomodation to their place of work in the back of a bus where there are 13 people in a minivan typically built for 7. Larger companies use commensurately larger busses, but now instead of 5 across the back seat there will be six or seven men. So what are these men all building? The simple answer is “A lot”. You may have seen building sprees in other parts of the world, London during the late 1980’s boom cycle, Berlin post reunification etc but trust me, there has never been a sight (or a site) like this. According to one estimate 2/3 of all the high rise cranes in the world are working on skyscrapers in Dubai. I have no idea if this is true, but looking around the city suggests that it may well be so. Everywhere you look (and I mean everywhere) there is a construction site; as an example I drove past what will one day be a hotel- except that it is currently known as “Hotel G9, Plot 4C, Dubai Marina”. Some day people may come to this hotel for a honeymoon, conclude a million dollar deal or simply to grab some winter sun for the whole family, but right now this dream is just known by a set of coordinates in a building site. And the building site is all on a truly grand scale: ‘Small’ towers turn out to be 40 storeys tall- they only look small because they are dwarfed by the Burj al Dubai. 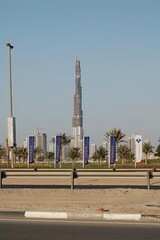 Attempting to put into words the scale of the Burj al Dubai tower is a task beyond me. I never saw the Twin Towers in New York, but if they so dominated the skyline that the first time you see them you are forced to exhale “Holy —-, look at the size of that thing” (insert your favourite four letter expletive to complete the sentence as you see fit) then you can understand the experience of driving into Dubai and see the Burj al Dubai for the first time. And the most incredible thing is that it is not even completed yet (there is probably another 10-15% of height to add, but no-one knows for sure how much) but then that is an over-riding experience of Dubai: Don’t expect a building to exist just because your map says it is there. There may be a building site or simply the idea of a future plan. Roads are equally impressive: it is not uncommon to find yourself on a 7 line highway. With another 7 lanes coming in the other direction and 2 lanes to filter on and off the highway. You had better be good at multi lane driving to get around in Dubai. And on that point, all the guide books tell you to travel by Dubai taxi, but just as driving around the Arc de Triomphe is a defining experience of Paris, so is filtering into the flow of traffic at just about any roundabout in Dubai. Just because it is a little scary, nothing like any driving manouver you perform in Europe or North America and has a recognisable probability of resulting in a crash or even death- well that doesn’t mean you shouldn’t have a go at it. Especially not when the large parts of the road system are likely to change in the near future, as the building spree continues unabated. I’d be tempted to say to Dubai: “Call me when you are finished” but I don’t think that they will be. Not for a long time anyway, and in the meantime, there is just so much to see in Dubai- as long as you don’t mind touring around the occasional building site. So what are the impressions that Dubai leaves after 3 days? Well there is or will be irrigation everywhere. Coming from a green country this is a good thing on a purely asthetic level, but it may also serve a secondary purpose for the residents of Dubai: There is an all pervasive dust that hangs in the air giving every sight a faintly brown tinge. Some of the dust is coming from the construction but most of it is coming from the little matter of the desert. So by creating grass (even at the cost of needing to water it all the time) it should be possible to improve the air quality. I’d suggest to anyone who owns an irrigation supply company to set up an office in Dubai as soon as they can, but all the big contracts are probably already won, so you may be too late. This division of people follows on to accomodation: there are palaces (and I mean palaces) on the beach that a mere glimpse through the fortified iron gate evokes an immediate flashback to “Lifestyles of the Rich and Famous”, then there are huge numbers of new developments for the middle class ex-pats and then there is the accomodation for the workers. When I worked in Kazakhstan we lived in trailers- each ex-pat had a 6′ 8″ by 7′ room, which was quite comfortable thank you (especially considering that the trailers in Yemen were 7′ by 5′). The local workers on the other hand had larger rooms, instead of 6′ 8″ they were 10′ across. Except that 6 men were housed in each room. Simply looking at the outside of the accomodation blocks brought the images of our trailers in Kazakhstan to mind. I don’t know how many men are crammed into each room, but I would not be surprised if they were more densely populated than our trailers in Kazakhstan. An on-going issue for the tourist industry in the middle east is the impression that europeans and north americans of my age and older continue to hold. On a truly simple level is the street names and the mental image that a name conjures: there is a Beirut Street, which is not too far from al Jazeera avenue. Neither of these names should mean any more than Main Street or Station Road, but as a westerner we are fed an impression of a place by the media. Beirut conjures images of a war torn city, even though it is more properly known as one of the more beautiful parts of the world and al Jazeera is associated with terrorists even though it is no more responsible for acts of terrorism than the BBC was for reporting on the Troubles in Northern Ireland. Of course there will always be the cynics who say that the amount of construction going on does mean that the Beirut image is not too far from the mark, but they are just perpetrating myths and holding onto prejudices that have no place in the world we should be trying to form. So getting past simple names, what do the different regions of Dubai have to offer? 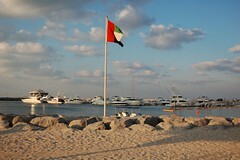 There is “old” Dubai, and Deira is the heart of old Dubai giving the best claim to be the “real” Dubai. 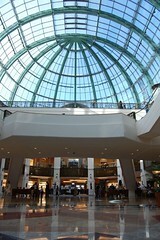 It has the atmosphere of the souks, as all the development is south of the river (in the new downtown core of New Dubai). This gives Deira a fell of reality but may mean that the low-rent feel that Deira has will only be exacerbated as the money moves away. On one had this will allow tourists to experience the wonderful chaos that is the middle east, with all the sights, sounds, smells and activity that a traditional souk brings. And a quick piece of advice: Nighttime is the only way to experience the souk- after dark there is just an incredible atmosphere, enough neon and electic light to make it seem like daylight and activity everywhere. Depsite all the tourism in Dubai I was still the only european face on the street in the heart of Deira, and either through naivete of sheer dumb luck I didn’t feel threatened once. But as with any city, follow basic safety procedures, like not following someone into a dark alley, even if they are offering a Rolex for $20. 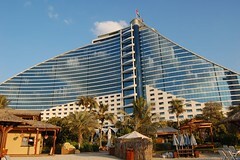 Then there is the beach development of Jumeirah. This is the prime focus of the tourist development and it will totally appeal to anyone wanting guaranteed sun, excellent service and something just a bit different from the standard package offered to Spain or Greece. It is entirely possible to spend a whole week in Jumeirah and play sport, go swimming in the Red Sea, gaze at the Burj al Arab, go shopping at the Mall of the Emirates and even go skiing on snow. There are many, many people to whom this will appeal. Just not me. I wanted to get out more, so I went inland. 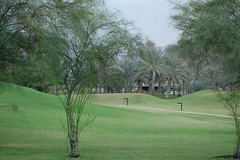 Another difference from my memories of the desert is the amount of garbage in outside Dubai. OK, I was in the aptly named Empty Quarter, but the desert outside Dubai is nothing like I remember. I remember a clean, almost pristine place, where you felt obliged to pick everything up because it would be blindingly obvious who dropped the litter. On the road from Dubai to the mountains, garbage is blowing around everywhere. It is a real shame and something that is obviously being overlooked in the mad construction spree. Long term I hope that the inhabitants of Dubai realise that all the flashy hotels in the world won’t make up for the fact that the back yard is a tip. But, if you can see past the garbage (and avoid the trucks carrying to construction materials to and fro) there is a little jewel that is part of Dubai. 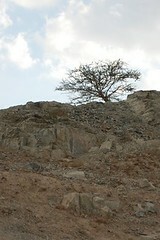 It is hidden in the mountains and called Hatta. As Sonoma is to San Francisco, so Hatta is to Dubai. I continue to wonder how does Sonoma continue to not be pretensious when everyone who goes there says that the beauty is that it is not pretentious. Surely this reporting should have attracted the very people who will turn Sonoma into a tawdry, tourist trap, and yet it still manages to maintain its beauty and charm. As it is with Hatta. Hatta is an old town, with but one hotel (though a damned fine one), one little historic museum and really not much more. But I liked it. And I liked the mountains around it. 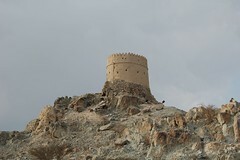 And I liked the fact that I had to drive through Oman to get there. Though I didn’t stop at a border point, the only way I knew that I was in Oman was that my phone welcomed me to Oman. 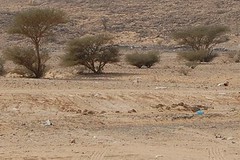 And that brings up another question that I was unable to answer: As you drive along the road to Hatta, there are any number of small shops by the side of the road. The shops are often nothing more than a single room with stock in (and also placed outside to attract passing trade) but I wonder what trade? There seemed far too many shops to support the number of people driving by. How do these shops support their owners? Who buys the goods? Or maybe it is just an outlet for latent business acumen. I have no idea.